San Diego is a city I’ve come to hate to love. San Diego represents the best of urban life and the worst of urban settlement patterns. San Diego is a city wrestling every day with contrasts; wonderful climate, multimodal transportation, eminently walkable, family-friendly, dog-friendly, bike-friendly, LGBT-friendly, yet not environmentally friendly. Not really, but they do try. A flight from Nashville to San Diego take about 3.75 hours. I arrived in Nashville about 6.30am Friday morning, an outside temp of about 75F with 60% humidity. Sticky, but not uncomfortable. I arrived in San Diego about 11.30am and conditions were about the same. San Diego, I would discover only today, was hours away from thunderstorms developing from the tropical storm Dolores. San Diego tends to have humidity in the high 60s and low 70s (%). My guess is San Diego feels nicer due to lower air temps than I experience in Kentucky and Tennessee. Our relative humidity tends to hover in the mid-80s in July. But, relative humidity is not a good way to compare how distinct places “feel.” A better way is to examine dew point. The dew point is the temperature at which the air becomes saturated. When the air becomes saturated, we experience this as rain, perhaps fog, a shower, a thunderstorm, some type of precipitation. When there is a nice difference between air temp and dew point, we feel nice and dry; no sticky business. When the gap between the air temp and the dew point narrows, now we begin to feel damp and clammy, and we wish for rain. San Diego tends to have dew point temps in the low- to mid-60s and air temps in the mid-70s. Thus we have a nice difference of about 11 degrees or so. Nashville tends to have air temps around 80 or 90, but the dew point also tends to be high, in the 70s or 80s. Thus the gap is narrower and we feel hot and sticky. San Diego is a city I want to love, and do to a waning degree with each visit. San Diego woos visitors with nice bike lanes, and seduces visitors with beaches, sun, and clear air. San Diego feels like vacation, warms a body the same way a yoga stretch might. San Diego is urban yoga. Everyone passed on the sidewalk carries an air of relaxation, peace, and solace. From the German tourist family, the small group of Africa women herding small kids asking, “What is hummus? Why won’t you tell me about hummus? !” to the individuals walking their chill dogs down the sidewalk. San Diego exudes chill. Not everyone is probably chill. For as much as San Diego epitomizes vacation and relaxation, San Diego also epitomizes urban sprawl, urban blight, and urban homelessness. One must be prepared to see homeless everywhere, all the time, non-stop, day-in, day-out. San Diego’s homeless are as ever-present as pigeons, more present than fire hydrants. Yet, I have found them to be more quiet, less assuming, and less confrontation than those I have encountered in Chicago. I have talked to them, asked about their pets, herded the drunk ones away from the path of oncoming trolleys. Rarely, have I been accosted by a homeless person. Someone once told me San Diego allows them to stay as long as they don’t bother people. The homeless sit with a sign, or perhaps speak in hush tones asking for a dollar. Enjoying San Diego truly feels like a guilty pleasure. I don’t see how people who fly, and look out their window to watch the desert pass away beneath them, 100 miles every 15 minutes, can think building in the desert, farming in the desert, can make rational sense. The Sonoran Desert covers almost 12,000,000 square miles in the Southwest United States. Yet, in spite of the heat, in spite of the lack of moisture, in spite of inhospitable conditions, people feel the need to terraform this environment using resources from other environments, to the detriment of both environments. With each flight to San Diego, I notice farmland, residential, and commercial land capturing more and more of desert. Humans imposing their will upon a landscape which begrudgingly accepts the water, forcing upon the resistant ground our whims and dreams. In the pic (left) we can see a patchwork of agricultural fields. 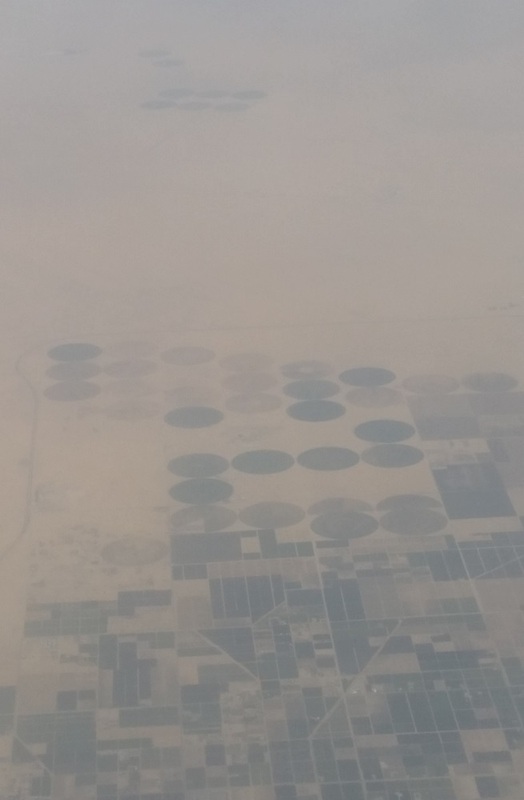 South of those we see the diagnostic imprint of green circles characteristic of pivot irrigation. Usually, at the center of each circle is a well, powered by a water pump, drawing water from an aquifer to moisten the soil. These green circles are probably 1-mile in diameter. Now, even further south (image-top) we can make out 6-8 additional pivot irrigation crop circles. In between the green circles in the mid-ground and top is the Sonoran Desert. San Diego experienced severe weather this afternoon. In fact, today set a new record for rain event in San Diego, receiving 1.02 inches. (San Diego Union/Tribune) People might believe severe notions, all false, such as this one: “I’m glad we had rain. We needed it. It will help out our water table.” No, today’s rains won’t even see the water table, most likely. Nearly 2/3rd of all rainfall ends up as runoff, never penetrating the ground. Of the 1/3-rd remaining the majority of that moisture will almost immediately be recycled into the atmosphere due to evaporation. Some of the remaining water will soak into the soil but never reach any aquifer. Aquifer recharge rates are not measured in a single rain event, even if that rain event is significant. Aquifer recharge rates vary by geology and geography but most recharge rates are measured in 1000s of years, not months or years. I’m here for the 2015 ESRI Education Conference and International Users Conference. By participating in the conference I contribute to the economy which imposes what I consider to be irrational behavior upon the landscape. However, even in Kentucky I contribute to terra-forming the parched landscape of the American Southwest each time I buy tomatoes, lettuce, or asparagus. Only now, by visiting I use their water when I shower, flush the toilet, brush my teeth, or buy coffee. A sign in the local coffee shop posted above the sink reminded employees, “Droughts are not funny. Wash your hands but conserve water.” Every hotel I have stayed in asks guest not to have their room serviced unless absolutely needed. This weekend, there are about 1000 of attendees for the education conference. By Monday, that number will blossom to 15000 or so. However, those people represent but maybe 10% of the people attending Comic-Con. While San Diego residents, all 1.38 million of them stress the environment, an extra 15000 to 150,000 don’t help matters. And, San Diego is 2 inches behind what is consider average, even with Hurricane Dolores delivering moisture. With each conference, I’m torn in my appreciation for all San Diego offers. People avail themselves to the bike lanes, the jogging paths, the dog runs. Each corner has a nice coffee shop with outside seating for you and your canine buddy to enjoy some confection and a nice coffee. Tourist roll by on Segways, or sitting in the back of a pedicab. I like walking around the city, checking out the property listings while heading down to the waterfront to watch a Dole transport ship unload or admire the fantastic boats in the harbor. I’m torn because on my flight to San Diego I see how humans are modifying the desert beyond our ability to sustain that environment in safe, healthy, and rational ways. In a sense, we have assumed a Russian view of the environment: with enough money, power, effort, and will we can force Mother Nature to obey us. She will cow to our greater ego. The ESRI conference has 15000 attendees. Quite a few. The conference is organized by ESRI, a software company whose headquarters is 90 minutes away, in Redlands, California. ESRI alone requires 18 semi-trailer trucks to move conference materials from Redlands to San Diego. The San Diego Convention Center has the advantage of both immense size and proximity in order to be a suitable host. Few places in the United States are large enough for the conference and close enough to be able to mobilize materials in a cost-effective way. Rumors have abounded the conference may be split into East/West conferences, though these have not materialized. The single, annual ESRI User Conference requires a years’ worth of planning, making dividing the conference into two large regional conferences extremely unlikely. The conference is valuable. For me, the ESRI Conference, especially the Education Conference, builds an environment encouraging my brain to work, evoking my brain cells into action, awakening energies and networks inside my head dormant since my last conference. I think conferences are supposed to be like that. Being around other innovative, energetic, thoughtful, and also humble people merely trying to solve problems is an invigorating atmosphere. “Oh, I’m not alone. Others are working on similar issues and facing the same troubles. Today, we listened to innovators and problem-solvers who haven’t even yet finished college. One young fellow took the place of his high school teacher who was unable to attend the conference. One young woman was inspired by Jane Goodall and took on the palm oil industry as well as the Girl Scouts. This morning, we listened to Madison Vorva discuss her efforts to change the recipe for Girl Scout cookies, pushing for the elimination of palm oil. (Palm Oil and Scout Cookies. NYT 2012.) These opportunities to stand beside someone who was a literal child working with Jane Goodall a couple of years ago do not come around often. The problem faculty have with being made responsible is many-fold. First, the university admissions office should know whether or not the person enrolling is from a listed country. This should initiate a flag of some sort. Anti-discrimination policies plus profiling rules prevent the faculty member from asking students directly about their country-of-origin. Thus, questions have to be formed surreptitiously from which info can be gleaned allowing the faculty member to determine whether or not a student is from a listed country. Crazy legal-stuff comes up sometimes. PAX.